The UNDP-GEF Global Access and Benefits Sharing (ABS) Project recognizes the value of traditional knowledge and the role of women in preserving and transmitting it to new generations. 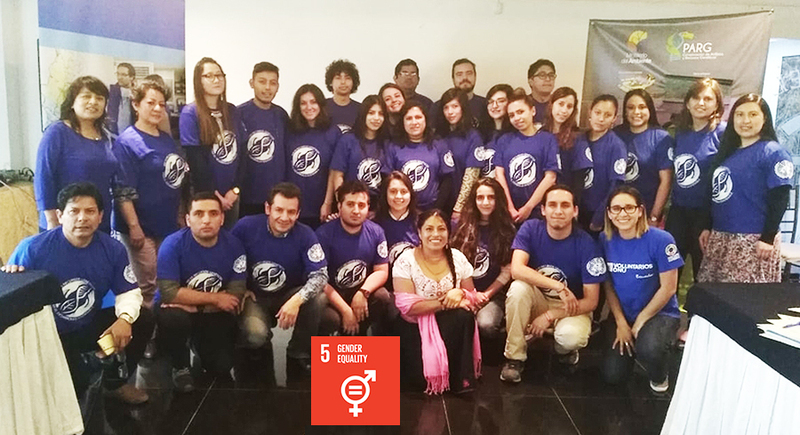 Supported by UNV, the project promotes the participation of women from indigenous populations as volunteers for the implementation of the Nagoya Protocol. Rich in traditional knowledge and genetic resource knowledge, these women are scientists in their own stead. Volunteers leading the UNDP-GEF Global Project ABS in Ecuador. The fair and equitable distribution of the benefits derived from the use of genetic resources is one of the three pillars of the Convention on Biological Diversity, and its application is the main objective of the Nagoya Protocol on Access and Benefit-sharing (ABS). More than 50 volunteers from indigenous populations and local universities collaborate to guarantee access to genetic resources and fair and equitable distribution of the benefits derived from their use in the Dominican Republic, Ecuador and Panama. Women volunteers possessing invaluable traditional knowledge and genetic resources are recognized and valued as scientists. MsTsholofelo Dichaba, Programme Coordinator at the University of Botswana, and a scientist who is a member of the Global ABS Project affirms the value of the holders of traditional knowledge. UNV supports the implementation of the Global ABS UNDP-GEF project "Strengthening human resources, legal frameworks, and institutional capacities to implement the Nagoya Protocol". To date, the project has mobilized eight national UN Volunteers, one international UN Volunteer, and 14 UN Online Volunteers. UNV develops the capacities of national volunteers, who participate in raising awareness of the importance of biodiversity conservation, genetic resources, associated traditional knowledge and fair distribution. It has a lot of value for our people, that volunteers are local people of the community, facilitate communication amongst indigenous peoples and consolidate our visions regarding traditional knowledge. --Sara Omi Casana, national UN Volunteer in Panama. To engage communities, more than 50 volunteers have mobilized over 180 people involved in conducting surveys of knowledge, attitudes and practices (KAP), in order to conduct information campaigns on ABS, develop a community biocultural protocol and facilitate exchanges between local communities in the Dominican Republic, Ecuador and Panama. The identification of synergies and the exchange of existing experiences on volunteerism have been fundamental in the execution of activities, since they have prepared the foundation for strengthening the capacities of these young people and engaging them in the Global ABS project. The involvement of volunteers in the generation of knowledge through the KAP surveys has facilitated the collection of data necessary for the goals of the project. At the same time, this has indirectly sensitized on the access and participation of benefits, rousing their interest through interviews to get informed and contribute to the achievement of project goals. Being a UN Volunteer is a great experience for me. I can help, I am practicing in my area of expertise area and learning new things that will be useful in the future. --Melisa Correa, Volunteer for KAP survey, Univesidad de las Américas, Ecuador. Additionally, alliances have been made with national organizations that support these initiatives. These include the Ministry of the Environment of the Provincial Directorates of Sucumbíos, Carchi, Esmeraldas, Guayas and Chimborazo in Ecuador; Ministry of Environment of Panama, Authority of Aquatic Resources of Panama, Smithsonian, University of the Americas and University of Panama; Ministry of Environment and Natural Resources and Ministry of Agriculture of the Dominican Republic, Autonomous University of Santo Domingo, among others. An indispensable element of the project has been the inclusion of volunteering in indigenous communities. In Panama, the El Piro (Comarca Ngabe Buglé) and Emebrá Ipeti (Province of Panama) communities have become ambassadors for the Nagoya Protocol, mobilizing the entire community to participate in the project's processes. In this sense, the UNV component has added value to the UNDP-GEF ABS Project. Not only has it made it possible to achieve the expected products, but it has also inspired more people to commit through volunteering. Moreover, it has demostrated that volunteerism is an effective way to include women who possess traditional knowledge on genetic resources, as scientists and leaders in their development processes.